On June 14th and 15th, it seemed like someone turned back the clock in Wetaskiwin. 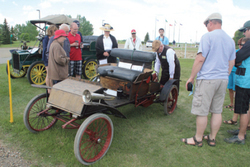 More than 600 antique and classic cars, trucks and motorcycles arrived in the City and joined the ‘History Road’ display at the Reynolds-Alberta Museum where the owners, vehicle enthusiasts and spectators spent a weekend sharing many fond memories and stories. On Saturday, June 14, at 4:30 pm the vehicles left the museum grounds and cruised through Wetaskiwin to showcase their splendor. More than 2200 people attended the event on Saturday alone. History Road, the Ultimate Car Show, is hosted by Reynolds-Alberta Museum to instill interest and knowledge of historic, antique and classic vehicles. The History Road car show has become a festival-of-sorts; vehicles are displayed and paraded, participants connect with old friends and meet new ones and all the onlookers praise the cars and envy their owners. Perhaps more importantly, this one-of-a-kind spectacle provided a medium where car enthusiasts could share information and friendships surrounding the ownership, restoration and preservation of their vehicles. The Alberta Motor Association, one of the major sponsors of the event, was on site to give visitors money-saving driving tips. During both days, the Parade through the Century showcased vehicles by era in a series of decade-themed drives on the museum grounds. The Museum displayed 37 vehicles from its own collection, including a 1905 Waltham-Orient Buckboard prototype, a rare 1919 Grey-Dort Ace, a 1969 Dodge Charger SE, a 1975 Bricklin Gullwing Fastback and more. Visitors also had the opportunity to visit the museum’s current exhibition ‘The Fabulous Fifties’, find the perfect gift for an automotive, aviation or machine enthusiast at the Museum Store and enjoy tasty offerings at Cruisers Café. Regardless of what type of vehicle attendees may have owned, or the type of vehicle they wished they had owned at some stage of their life, they likely found it at History Road. For more information contact Cynthia Blackmore, Head, Marketing and Communications Reynolds Alberta Museum 780 361 1351.